LOGAN, Utah – To celebrate Campbell Scientific’s 40th anniversary, the company hosted a customer open house on March 27th for their clients, integrators, and vendors. Integrators from across the globe were among those in attendance at the Logan headquarters. Paul Campbell, company president, kicked off the open house by welcoming the attendees and thanking the resellers who participated in the company’s conference. Paul acknowledged his brother Evan, who was one of the company’s co-founders. Evan has been writing a series of historical articles that provide a first-hand account of Campbell Scientific’s humble beginnings, and several of his articles were made available to attendees. Paul also reflected on the influence Dr. Sterling A. Taylor (deceased) had on many students in the College of Agriculture at Utah State University. Dr. Taylor’s guidance helped shape three Campbell brothers who were his students and employees in the soils laboratory. One of the brothers, Eric, became a co-founder of Campbell Scientific. Dr. Taylor’s son, Dr. S. Elwynn Taylor, was in attendance. Following the presentation, Evan Campbell cut the ceremonial first piece of cake. Attendees were invited to remain in the reception area and visit, take a small group tour and observe the company’s operations, or view a specially prepared display featuring key products significant to the development of the company. The customer open house was followed later in the afternoon by an employee open house. Campbell Scientific employees were encouraged to bring their families to view the product display. In August, Campbell Scientific will celebrate the date the company was incorporated. 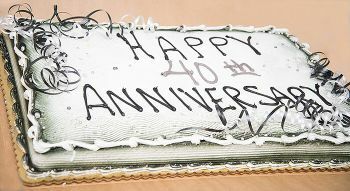 A special 40th birthday party is planned for the more than 300 employees who contribute to the company’s longevity and success. Campbell Scientific, Inc., is a worldwide manufacturer of dataloggers, data acquisition systems, and measurement and control products. To learn more about Campbell Scientific, Inc., please visit www.campbellsci.com.